16 inch Maple Leaf hanging basket with coco liner to promote healthy plant growth. This will add an elegant touch to your home or patio. Long lasting powder coated finish. 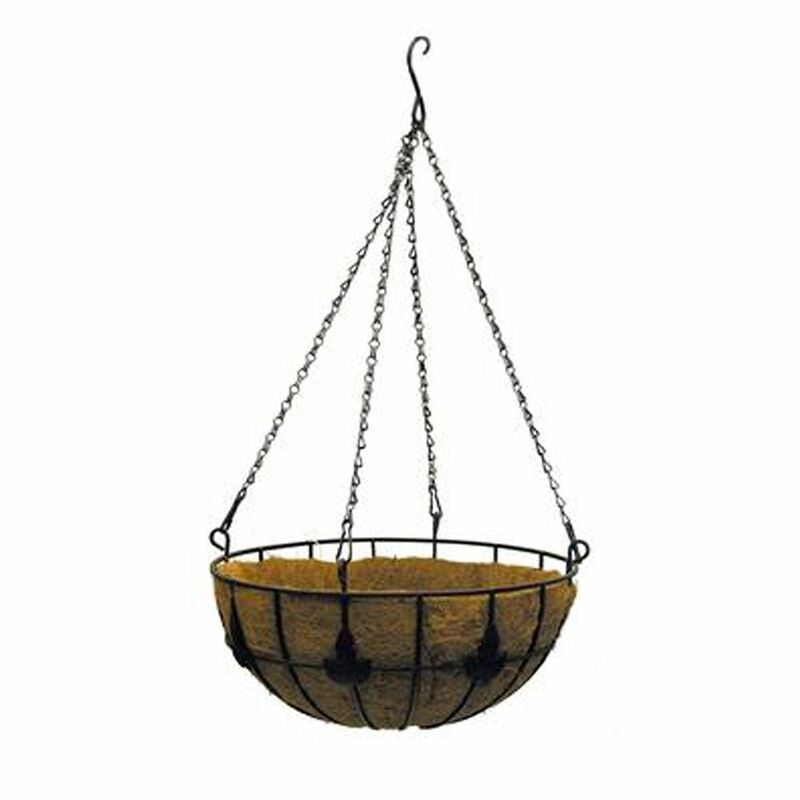 Make a statement of your indoor/outdoor decor with this beautiful, Hanging Basket in Copper. The attractive silhouette and classic design allow this piece to coordinate perfectly with existing settings, whether traditional or modern. Looks stunning when set against a garden backdrop. Enhance your home and garden with this pot set Statue Decoration. Is sure to bring peace, harmony and tranquility to any environment. Beautifully hand decorated indoor - outdoor sculpture, perfect for outdoor use. Are you looking for a planter set thats contemporary yet feels homey and nostalgic? Well, stop looking, Keter is introducing a new generation of stunning stylish and functional planters with the Keter Knit Collection, You'll love the eye-catching Cozie planter which integrates beautiful texture together with a unique feel and stylish design that complement your home. The detail on this resin planter is remarkable, as it has been designed to give you the intricate, interlocking woven knitted look of a braided knit-style design. Because they are made of durable polypropylene resin, the Keter Cozie Knit planter is able to withstand incredible amounts of wear and tear. In fact, this decorative planter set continues looking like new from one season to the next even if theyre kept outdoors. With durable resin construction, you can rest assured they will never rust, peel, dent, fade, stain or unravel. These handy plant hangers twist into any number of channels within a Palram greenhouse to fasten a shade kit, hang irrigation tubing or suspend a pot or hanging basket. This bundle includes 10 plastic hangers, which also clip into the separately-sold Palram heavy-duty greenhouse shelf for more suspension options in your nursery. 16-inch Maple Leaf Coco Hanging Basket 16 inch Maple Leaf hanging basket with coco liner to promote healthy plant growth. This will add an elegant touch to your home or patio. Long lasting powder coated finish. 16-inch Maple Leaf Coco Hanging Basket is rated 4.0 out of 5 by 1. Rated 4 out of 5 by Chaud1971 from Sturdy Baskets I bought this a month ago in preparation for next spring. The baskets are sturdy, the coco fibre is tightly woven and appears it will stand up to many seasons of use. I fear the baskets are too shallow thus limiting the amount of soil and therefore not allowing enough root development. How deep is the planting area?